Hungarian Prime Minister Viktor Orbán has told a European Union social summit that the Hungarian model on the economy and migration is working “and we Hungarians don’t plan on replacing it”. In his speech at the session on ‘Changing Jobs to Meet Challenges’ on Friday, Mr. Orbán said his government is told of “many good ideas” about meeting labour market challenges, “but the success of our policy is not dependent on the quality of those ideas” but on a strong economy and rejecting mass migration, reports Hungarian wire service MTI. The Fidesz party leader explained that the Hungarian model rested on three “pillars”. One of those pillars was building a work-based society with everyone in employment, and the second was the government adopting a “flexible” attitude in shaping labour and tax regulations. Thirdly, the conservative said that “we don’t want to resolve demographic or labour problems from the outside, through immigration”, in pointed comments to Eurocrats and mass migration advocates who are pressuring the Central European nation to open their borders and accept the forced redistribution of asylum seekers. “Hungary was in a very deep depression prior to 2010, but we established a Hungarian model,” Mr. Orbán said, reminding those present that the unemployment rate in the country was 12.5 per cent, as opposed to four per cent today, while the economy was minus five or six per cent and is now at plus four per cent. The country now has a growth of four per cent and the budget deficit has been kept under three per cent of GDP, Orbán added. “We Hungarians, who have been pulled out of the economic crisis by our own model also have no intention of replacing our own model,” he said. 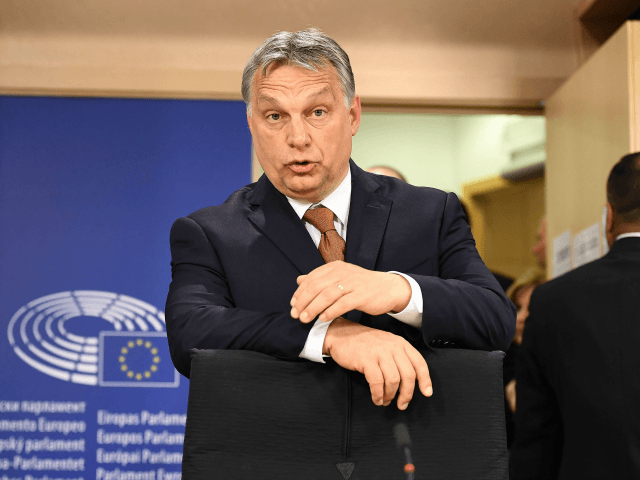 Conservative, Christian, anti-mass migration parties in Europe, particularly in Hungary and Poland, are seeing a surge in public backing following their sustained rejection of internationalist bodies’ pro-mass migration policies. Amongst those who plan to cast their ballots in Hungary’s Spring 2018 elections, Orbán’s party polls at 61 per cent – nearly four times greater than the second largest party, Jobbik. The figures signal that citizens prefer governments that stand by conservative values and protect their nations’ borders. Meanwhile, the party of German Chancellor Angela Merkel, who invited third world migrants to Europe in unlimited numbers in 2015, has suffered a 17-year record low in the polls.